In my last post, I introduced you to my new owl collection. 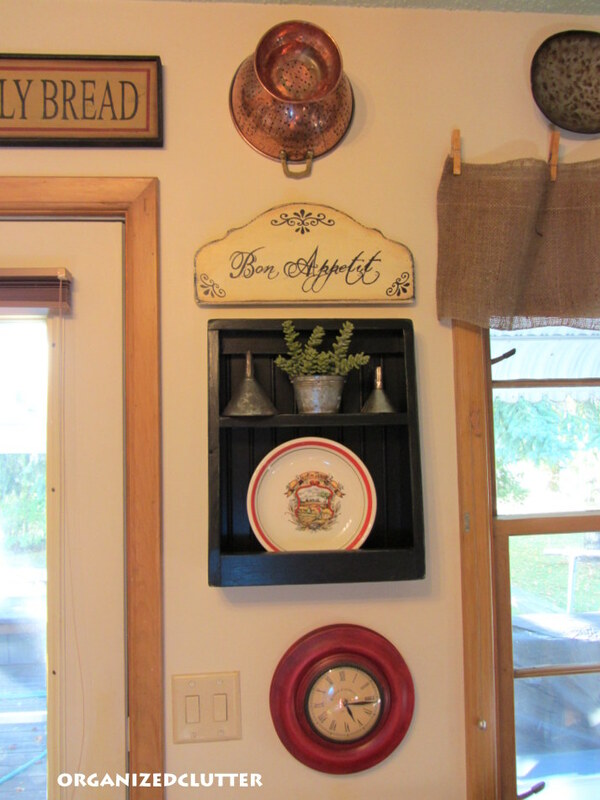 In this post, I am putting the owls to work in my kitchen shadow box. Five of the seven new owls are right here, along with some regulars like tin cookie cutters, red metal stars, Rumford biscuit cutter, tomato salt and pepper shakers, and Ball Jar. Other new additions are candy corn, a vintage orange Folgers coffee puzzle in a can, a vintage McCormick mustard tin, a pumpkin plate, and some fall foliage. 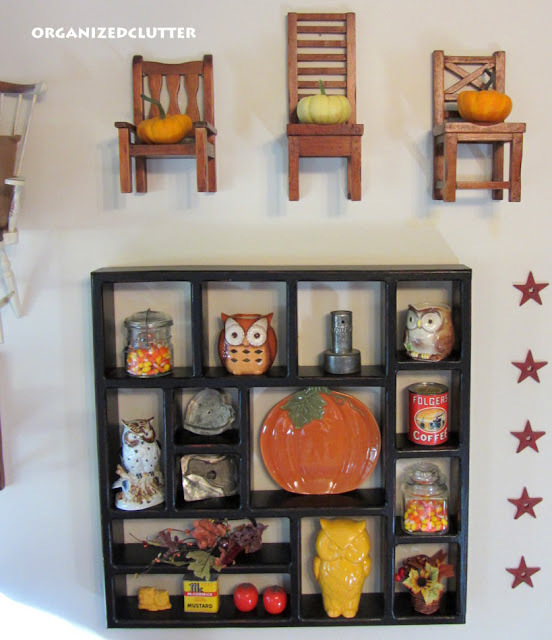 I have mini pumpkins displayed on my Pottery Barn chairs that double as mini shelves during holidays. 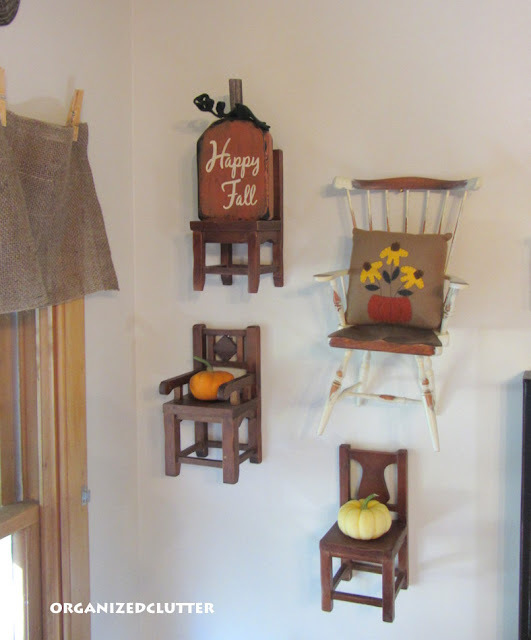 More chairs and a wood pumpkin sign, a Black Eyed Susan pillow, and more pumpkins. 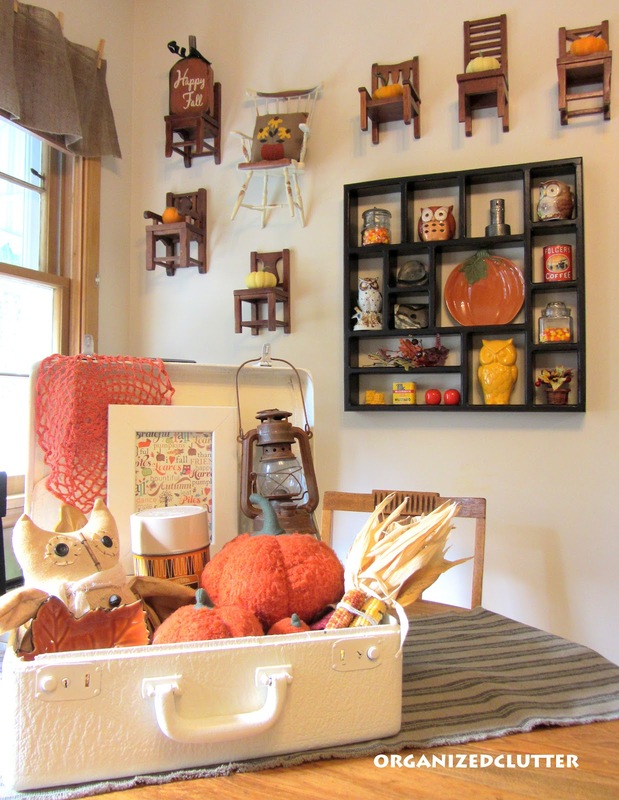 I think my fall suitcase is perfect on the kitchen table. 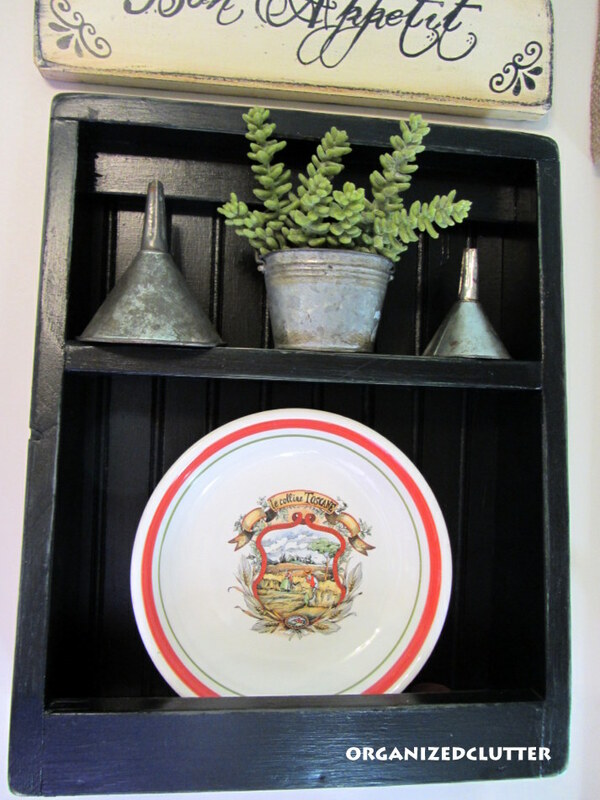 It's vintage and country, like the shadow box. I took the two orange books out of the suitcase and added a couple leaf shaped plates. They seemed more kitcheny! The flat bowl on the bottom was just purchased at a consignment shop for $3. It was made in Italy and marked Tre Ci. The plate pictures a man and woman harvesting in the fields. 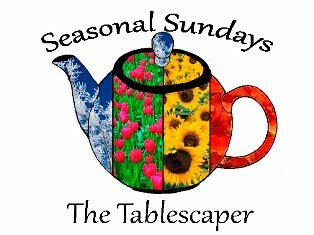 I thought it seemed like a fall scene and the stripe around the bowl is an orange red. 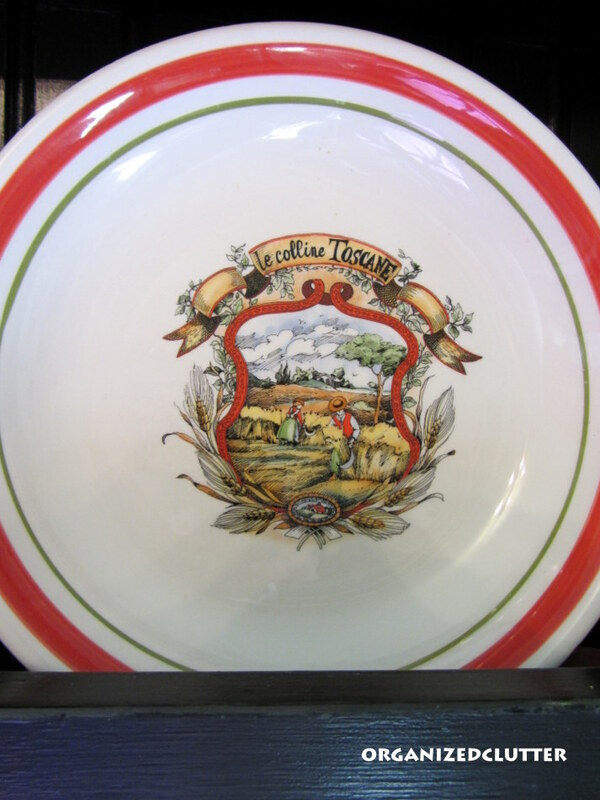 The caption on the bowl says "le colline Toscane". Meet Me Monday at You're Talking Too Much. I love your pretty kitchen decor! The shadow box is great...the owls are so much fun. I also love those cute chairs. I don't think it gets any cuter...I love it! I love it. It is just simply adorable. Love the pumpkin plate. Such an inviting and festive kitchen. I love your owl collection. As soon as I saw this I had to come see. I love owls and pumpkins and together they are perfect. I just love all the owls displayed in the cubbies. So darn cute!! Your little owls have found a perfect home. Love the collection of mini chairs. Did you say these are from Pottery Barn? Great little owl collection for your kitchen. It all looks great!! Those chairs are cute!! So many great owls out there this season! 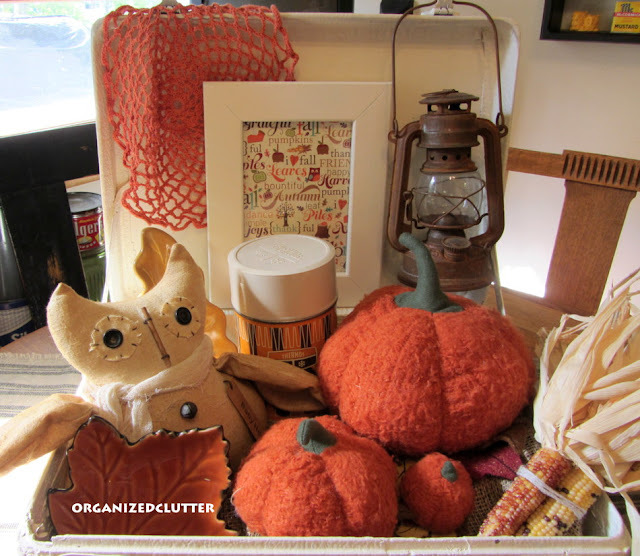 Love those fuzzy pumpkins and the idea of corralling it all in a suitcase, rather than a tray or box. 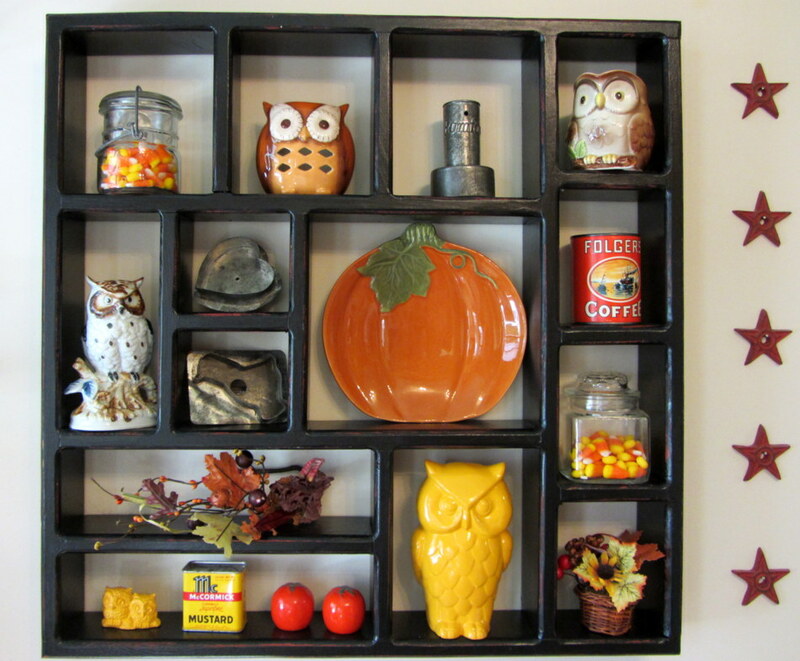 Look how perfectly your owls fit into your cubby! Your kitchen is looking very cozy for the upcoming cold weather. What an awesome and colorful display! I love owls. Your pictures are great too! Love the mini pumpkins on the little chairs! Oh wow. The chairs are cute...but the Owls! are adorable. I love that little black shelf and the little black box/shelf...both! Looks so cute! I love fall. The orange and yellow accessories are gorgeous on your black shadowbox! Love it! What cute goodies! Beautiful inspiration! Thank you fro sharing your project at Potpourri Friday!